A very quick question, I may have asked it before but nothing showed up on the search. If I were to use three point seat belts from the donor car, is there anything stopping me from having the seatbelt reel mounted inboard, feeding over the drivers left shoulder? It would then go from left shoulder to right hip where the seat belt buckle would latch, then across the hips to the anchor point down by the transmission tunnel. 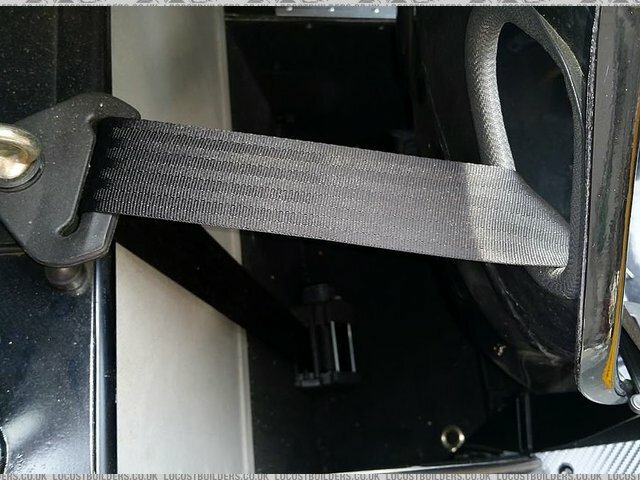 Assume all other considerations (structural integrity, belt security etc) are as required by IVA, this is purely to have the seat belt the other way round. 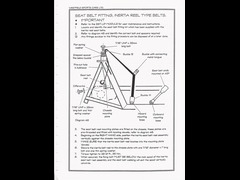 Passenger belt would be similar, so passenger right shoulder to left hip then across to right hip for the final anchor. the reel needs to have the top mounting above it so i cant see it working, whats wront with the reel on the outside a 3 point statics ? Rear seats in my M3 do this. Cant see any reason the principle would be an issue, assuming you can get it to function correctly. Its important when using OE reels to get the same orientation etc to ensure the inertia part fires correctly. It's actually the seat reel and the inertia function that is dictating what I'm planning to do. 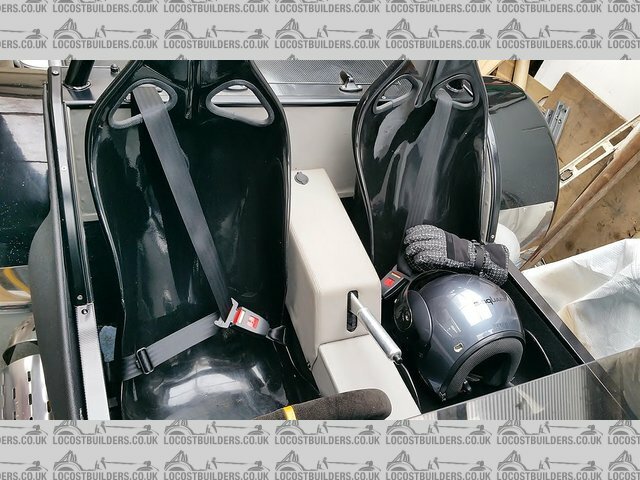 If I put the reel on the normal outboard mounting (IE behind the seat) I lose a precious few inches of seat travel and it wouldn't be directly below the guide (so I think it might not work properly). My plan is to bolt the seat reel to the diff mounting cage, then have the guide mounted above it on the cross member behind the drivers left shoulder. Having said that, conrodkid I think you've just pointed out something blatantly obvious that I overlooked, IE 'what is wrong with the reel on the OUTSIDE'. The use of the Healey body means that I can actually mount it 'outside' the frame. It would still be bolted to the same fixing, but wouldn't use up valuable internal space. Thank you both, I think I have more options than I thought I had. In 7 type car I'm not sure you've have space either side of the seat for the reel part of a donor cars 3 point seat belt. In a tin top they're buried inside the lower B pillar beneath the top retaining loop. Having taken a few out of tin tops over the years they're not small parts. Appreciate you may be looking to make maximum use of donor parts, but wouldn't 4 or 5 point fixed harnesses be a better solution? You're right, they are big chunky things that would compromise a good chunk of the seating area, hence the question. I may move to a 4 point harness at some point in the future, but I also want to use the donor seats which I believe would become load bearing if I used a harness. I think it would depend on the seats, fibreglass shells have a large space behind that I used for my reel, I wnted the reel on the outside so the "open" part of the belt was to the inside of the car. If you've got room then yes, you can mount them that way. Seen it on Westfield's and a few others. Interesting - did the car pass IVA like that? I would've thought [and it's only a thought] that the compression on the side of the GRP seats would've been highlighted as an issue - in the same way the upper mount can't have belt pressure applied on the seat itself in the event of accident, with the mount at the same height as the seat aperature (if that makes sense?). Unless you're supermodel thin - can i say that?!? But point well made, hadn't though of that. Every day's a school day! 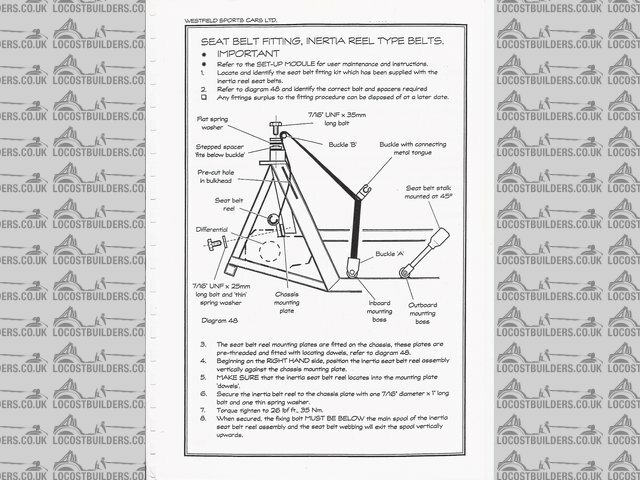 I bought an old Westfield SE build manual many years ago, which was very useful when I built my Locost. This was some time ago, so I have no idea whether this would pass IVA. Also, I have no idea whether it's a good way to do this - make your own mind up! 4, 5 or even 6 point harnesses still seem a better option to me. Fitted 4 point harnesses to my MK Indy and once strapped in you weren't moving far at all. My concern is the tiny amount of protection against leaning too much outside the vehicle. once tight on the outside, it would be very difficult to slip sideways towards the exterior. While on the inside, it would be easier to "submarine" under the shoulder belt..
Have to agree with you AA. Fixed harnesses seem better suited at avoiding these issues.